Take it to go, or sit and enjoy the sea breeze, with our outdoor seating. if you're feeling adventurous, bring a beach blanket and have a picnic, we are right at the beach. Ate here after a day at the beach. Service is great! Had the chicken nachos. Chicken and ingredients are all cook fresh to order and laid over fresh fried chips. It is special house sauce, with pico de gallo, cucumber and avocado. Marinated in a sauce of the house, with pico de gallo, cucumber and avocado. Tortilla chips with cheese, beans, guacamole, sour cream and jalapeños. 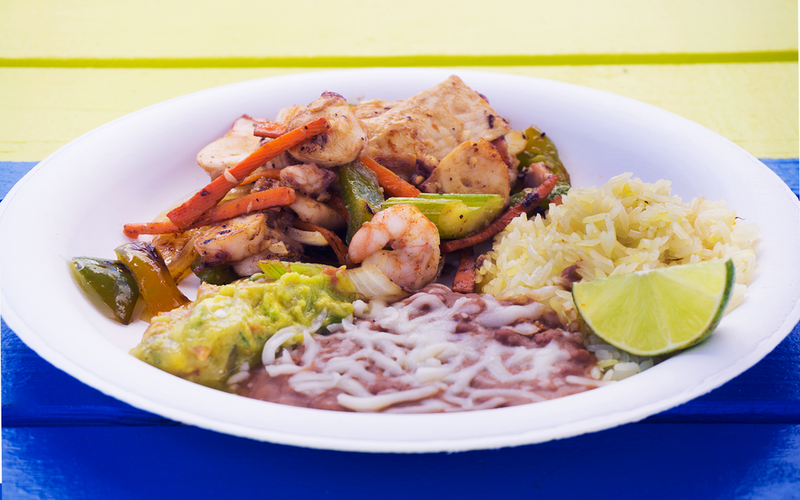 CHOICES: CHICKEN, STEAK, SHRIMP, FISH OR CARNITAS. Breaded fish steak accompanied with French fries and our special dressing. Fries topped with melted cheese, chicken, sour cream, and guacamole. This fajitas comes with shrimp, octopus & lobster. Served with guacamole, rice, beans and tortillas. Comes with tomato & onion inside, sour cream & guacamole on the side. CHOICES: VEGGIE,CHICKEN, STEAK, SHRIMP, FISH, MUSHROOMS, PASTOR OR CARNITAS. It comes with mushrooms, zucchini, carrot & celery, cooked with onion, tomato & filled with rice, beans & cheese. It comes with rice, beans, cheese & guacamole, cooked with onion & tomato. It comes with rice, beans & cheese, cooked with onion & tomato. It comes with rice, beans, cheese & guacamole. It comes with our special sauce, rice, cabbage, beans & cheese, cooked with onion & tomato. It comes with chorizo, potatoes, mushrooms, rice, beans & cheese. It comes with chicken breast, chorizo, zucchini, carrot, tomato, onion, cheese, rice & beans. It comes with ham, bacon, chicken, steak, polish sausage, tomato, onion, rice, beans & cheese inside. It comes with chicken breast, bacon, mushrooms, carrot, zucchini, onion, fresh tomato, cheese, rice & sour cream. Our most popular, it comes with steak, shrimp & cheese, cooked with onion, tomato & filled with rice, beans & guacamole. It comes with lobster, steak & cheese, cooked with onion, tomato, & filled with rice, beans & guacamole. It comes with shrimp, bacon, cheese, cabbage, onion, tomato, rice & beans. It comes with, cabbage, tomato, bell pepper, onion, rice, beans & cheese. GRILLED FISH OR SHRIMP; cooked with onion & tomato, comes with cheese & served with cabbage on top. BAJA FISH OR SHRIMP; beer batter deep fried, comes with cheese & served with cabbage & tomato on top. ENCHILADO FISH OR SHRIMP; (spicy) grilled fish or shrimp, seasoned with chipotle mayo sauce, comes with cheese, & served with cabbage & guacamole on top. STEAK (CARNE ASADA); cooked with onion & tomato, comes with cheese & served with guacamole on top. CHICKEN; cooked with onion & tomato, comes with cheese & served with guacamole on top. CARNITAS; comes with cheese & served with tomato & guacamole on top. VEGGIE; comes with tomato, onions, zucchini, carrot & cheese. CONTAIN (OR MAY CONTAIN) RAW OR UNDERCOOKED INGREDIENTS. CONSUMING RAW OR UNCOOKED MEATS, POULTRY, SEAFOOD, SHELLFISH OR EGGS MAY INCREASE YOUR RISK OF FOOD-BORNE ILLNESS, ESPECIALLY IF YOU HAVE CERTAIN MEDICAL CONDITIONS. 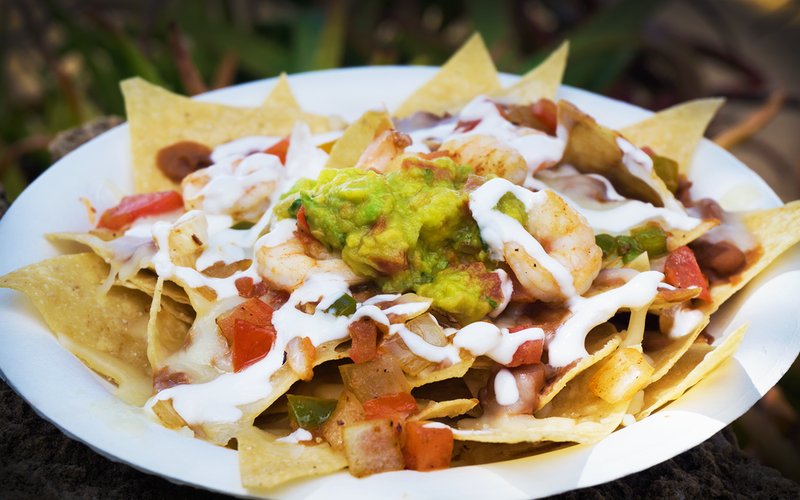 Come experience beachside Mexican food with the crew at El Rey Del Mar! Made and served with love.